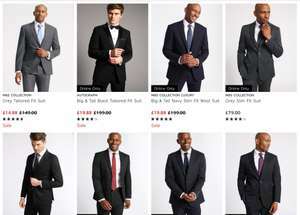 Marks and Spencer’s Sale on a few suits. Odd sizes but hope someone can bag a bargain. I managed to get 2 of the 'Savile Row' inspired ones for £25 each 2 days ago. Delivered to store yesterday and in average sizes. The jacket should have been £150 and the trousers £99. A bargain for someone - thanks for posting. Heat. I managed to get 2 of the 'Savile Row' inspired ones for £25 each 2 days …I managed to get 2 of the 'Savile Row' inspired ones for £25 each 2 days ago. Delivered to store yesterday and in average sizes. The jacket should have been £150 and the trousers £99.Bargain!